My goal this year was to read 120 books. I was tracking right along until about September, and then we launched London Littles and Tally stopped nursing a million times a day and fourth quarter got crazy as it does every year in the blogging world. So . . . I ended up just under 90 books. It’s still almost twenty more books than I read last year, so I’m counting it a win. I went through the list of everything I read and picked out my ten favorites – if you’re looking for something great to finish off your holiday vacation or start the new year with something fantastic, these are all excellent. I don’t know that I ever wrote about a book where I had as many people respond telling me that they’d listened to it after I recommended it and then just loved loved loved it. I mean, it’s basically impossible NOT to love this audiobook. This completely ridiculous take on the history of Lady Jane Grey is laugh-out-loud funny and probably in the top five audiobooks I’ve ever listened to (full review here). I’d meant to read this book for years and then it happened to be available as an e-book from my library, and I downloaded it and read through it in all of 2 days, laughing on pretty much every page. It was SO funny and completely fascinating about being an immigrant in America. Highly, highly recommend. I always love a good non-fiction read and this was a REALLY good non-fiction read. I have told so many people about various anecdotes from this book, and as a blogger, small business owner, and consumer, this was fascinating on so many levels. I mean, why DID 50 Shades of Gray become so massively popular? Why did the iPhone succeed when most people surveyed before its release say they didn’t want it? This book talks about all of that and lots more. I’m still pretty broken-hearted over her death, and this book, written before her diagnosis with terminal cancer, was a little hard to read when you knew, but she didn’t, that her life was almost at its end. It was so sweet, full of life and happiness, and so different from anything else I’ve ever read. It’s a quick read – you could probably get through it in a few hours or less, but it’s delightful. Fair warning that this book has a LOT of swearing in it (and I almost gave it up after a few pages), but when I kept going, this book stayed with me for the rest of the year. It’s stunningly well-written about an African-American girl who goes to an elite prep school (where she’s one of very few black students), but lives with her family in a dangerous inner-city neighborhood. After a party one night, she’s driving home with one of her childhood best friends when they’re pulled over by a cop and her friend is shot and killed by the police offer. And of course, I’d love to hear what YOUR favorite books were this year! Yes! I loved that one too. Could she just please write about fifty more books?! Well, my TBR list just exploded! The only book on your list that I have read was Textbook: Amy Krouse Rosenthal. I honestly can’t remember the last time I was so sad over a death of someone I didn’t even know. I read it last December and it stuck with me the whole year, especially with her NYT article and then her death. You’re so right that it is a unique reading experience. Happy New Year! I got so many great suggestions from you! My goal was to read 60 books this year and right now I’m at 62 and hoping to finish Small Great Things and/or Tom Hank’s book before the year ends (and they’re due back to the library). A few of my favorite books from this year: Pretty Girls by Karin Slaughter, on one hand this book was kind of graphic and a little too much for me, but on the other hand I read it in March and have thought about it periodically all year since then, so I guess it was a good one. Behind Closed Doors by P.A. Paris and The Marriage Lie by Kimberly Belle also had me hooked! Next year my goal is not a numbered goal, it’s more of a content goal, I read a lot of fiction this year and I have a nice pile of parenting, educational, and other heavier non-fiction reads to get to. I just may try out an audiobook to listen to My Lady Jane, I got Air Pods a few months ago and they are the most amazing device… so easy for talking on the phone or listening to music while you clean (they have awesome noise-cancelling so you really can talk on the phone while you do stuff) so probably great for audio books too! Happy New Year, Janssen!!! And I also LOVED The Hate U Give. I started reading it thinking it was another one about race that I’d read about, but I got mixed up. It was still a big win. 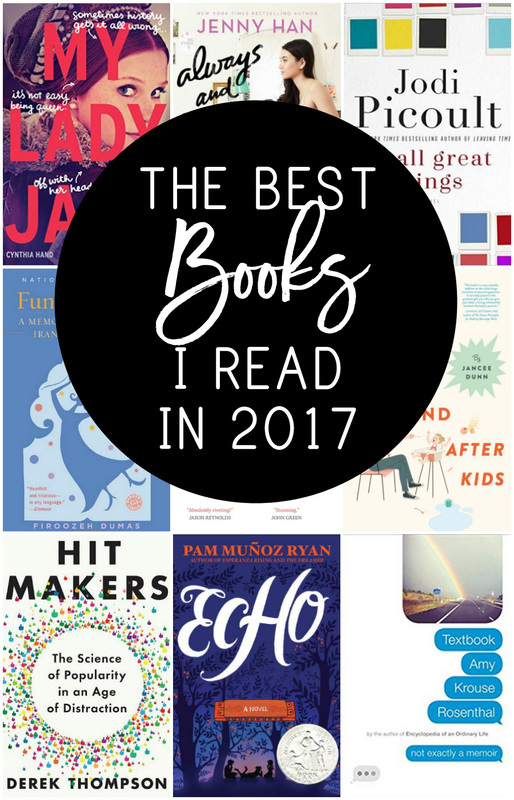 My most favorite book of 2017 is Last Bus to Wisdom, by Ivan Doig. It was written in 2015, just before Doig died, but I didn’t get around to reading it till now. I absolutely loved it. The young boy traveling by bus from Montana to Wisconsin and back in the early 1950s encounters myriad characters along the way. He and his cohorts are totally realistic for the time. I did not want the book to end. I read all three Laura Jean books in 6 days because I loved it so much! Also, My Lady Jane was AMAZING! Can’t wait to check out the other ones you’ve suggested. Thank you! Nothing I like better than hearing that someone fell in love with Lara Jean too! I found Funny in Farsi on my library’s used book shelf, and picked it up thanks to your recommendation. Making it a goal to read in 2018. A couple of these made it onto my own Best of 2017 lists as well! Although I must say, I tried How Not to Hate Your Husband but couldn’t really get into it…the author’s snarky tone in the beginning bugged me too much, as if she assumed that all marriages just tanked after kids. I probably need to give it more of a fair shot (since I only got about 40 pages in). Why does Libby have like almost none of these?? I can’t wait to try some more of your fiction picks! If you haven’t read Green Glass House yet, you need to pick it up. I just finished it, and it was such a fun read! Thanks for this awesome list!! Do you read all your books on a Kindle? And if so, do you have tips on how to afford so many books a year? My library selection is terrible when it comes to ebooks but I can’t spend Amazon prices to read all the books I want to. Did you already do a blog post on this? I actually read very little on my Kindle – mostly just when I’m traveling (I’d say probably less than 10% of my total reading). Most of my books are physical copies that come from the library or are on audiobook (which I get through the library too or through my Audible subscription). We listened to Echo with the family. It was our favorite book/audiobook of the year. Now we recommend it to everyone. I need to add all of these to my tbr list, especially Always and Forever, Lara Jean. I completely forgot to finish that trilogy. Please, please, please put a link to these books on goodreads also! So much easier!! That’s a good idea! I’ll look into making them into booklists there so you can add them all at once! Read It Ain’t So Awful Falaful by Dumas….she wrote it for Middle Grade kids and it very good too! Echo has to be listened to……it is essential for this title to hear all the music! I adored it! Can’t wait to give some of these a read this year. I loved when breath becomes air-it was my book club pick and I hosted a lunch themed around what a our last supper meal picks would be. It was a short read but has stuck with me for a good while. I also loved the glass castle and loved your posts with the author! Oh, thank you so much! I loved both of those books too. That sounds like the most fun lunch! I just can’t get over the audible ad on your page with the girl who looks like she’s about to drive her car off a cliff ?